A cunningly engineered super soldier breaks loose from a penal colony, and it is up to the Enterprise to catch him. The writers continue to come up with new mission profiles for the Enterprise crew. Instead of it always being a distress call or weird anomaly in space that starts the show, there are sometimes seemingly routine missions like this one, where they are simply checking up on a civilization that has applied for membership in the Federation. How does the Enterprise determine life signs? It hasn't been made abundantly clear, but it would stand to reason that things like body heat, respiration, and movement would be the main signifiers of life at a distance. Assuming that, how can Roga Danar not emit life signs? I know there's a hand waving line about Danar being able to block electrical signals, but that's not really an explanation. As a side note, in "Q Who," the fact that the Borg don't register life signs (because the scanners are calibrated for individual life) has never made sense to me either. This seems to me to be one of those sci-fi things that the writers gloss over a little too easily, like the universal translator or artificial gravity. Is it in Troi's job description to periodically roam the halls, seeking out people in psychic pain? It should be. Danar breaking out of the transporter beam is pretty lame, actually. I love the cat and mouse stuff, but I don't understand how Danar can be so familiar with Federation technology or ship layout. The Angosians aren't members of the Federation, and it is doubtful that they would have access to so much sensitive information, much less a reason for training their soldiers to navigate the complex ins and outs of a Galaxy-class starship. Danar is adept enough to intuit how to reconfigure the isolinear chips in Engineering so quickly that Data can't keep up, and he knows exactly where to look in a random cargo bay to find a pressure suit. I don't care how ultra-super-awesome a soldier he is, I just don't buy it. Still, the entire chase sequence is a lot of fun, especially in how it keeps you guessing as to Danar's ultimate goal. Danar knocks out everybody in Engineering awfully fast. I like that Worf is able to see through Danar's pressure suit ruse, even though he loses the hand-to-hand battle that follows. 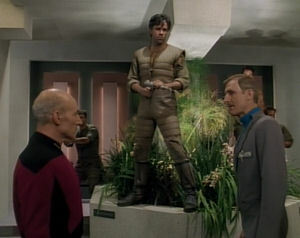 Picard is about to beam down onto a planet, to the exact spot where a group of angry superhuman soldiers are about to mount an offensive, and this is the one time Riker doesn't object to his captain putting himself in danger? At least he reinforces to Worf that the captain's safety is the first priority, but still, not even one word of token protest? James Cromwell is such a great actor. Picard makes the perfect decision by deciding to do nothing. "It's been an interesting visit." Good stuff. Cool story. It uses a sci-fi staple, the super soldier, to exaggerate and explore some real world issues about how we treat our veterans, but it uses action to ensure that the plot doesn't get too preachy.